DEAR NOBODY: TRUE DIARY OF MARY ROSE by by Gillian McCain, Legs McNeil. Fans of Go Ask Alice will devour Dear Nobody, a real teen's diary, so raw and so edgy that it's authenticity rings off every page. More than anything, Mary Rose wants to fit in. To be loved. And she'll do whatever it takes to make that happen. Even if it costs her her life. Told through the raw and unflinching diary entries of a real teen, Mary Rose struggles with addiction, bullying, and a deadly secret. Her compelling story will inspire readers—and remind them that they are not alone. Thanks to Sourcebooks Fire, I received an ARC of DEAR NOBODY: TRUE DIARY OF MARY ROSE. I just started reading it and I'm definitely drawn to the writing. I'm a part of the street team so for the next month, you'll be seeing frequent posts about DEAR NOBODY. 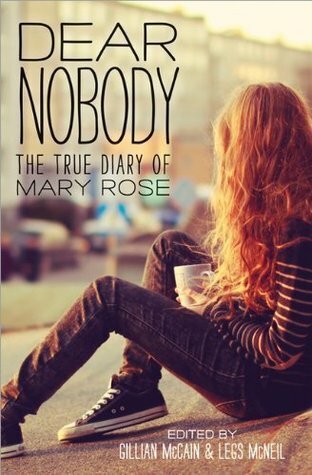 The official website was recently launched, so head over to http://www.dearnobodydiary.com to find out more about Mary Rose, and read an excerpt from the book! This book is (according to the publisher) a compilation of diary entries of a real person - Mary Rose. They'll also be sharing actual scanned copies of the entries on the website so be sure to check it out! Meanwhile, here are some lines from the book! This sounds great. Thanks for sharing about it.